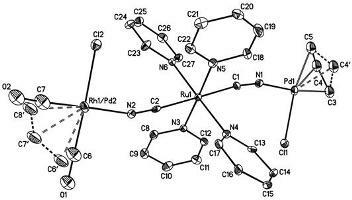 Trans-[RuPy4(CN)2] cleaves chloride bridges in [Pd((η3–C3H5)Cl]2 to form heterometallic triad complex [(η3–C3H5)ClPd(NC)Ru(Py)4(CN)PdCl(η3–C3H5)] (I). Action of trans-[RuPy4(CN)2] on the mixed (1:1) solution [Rh(CO)2Cl]2 + [Pd((η3–C3H5)Cl]2 yields non-symmetric triad [(CO)2ClRh(NC)Ru(Py)4(CN)PdCl(η3–C3H5)] (II) which coexists, in solutions, with related symmetric triads, I and [(CO)2ClRh(NC)Ru(Py)4(CN)RhCl(CO)2)] (III) in binomial 1:2:1 proportions. Under action of [Rh(CO)2Cl]2, II transforms into III with parallel formation of [Pd((η3–C3H5)Cl]2. 13C chemical shifts of the Rh-bound CO, 13C and 1H chemical shifts of Pd-bound C3H5, and Ru-bound Py ligands are sensitive to the nature of the ligands at a remote metal center. X-Ray structure data for the 1:1 co-crystal of I and II are presented.